World Market is a dangerous place. My roommate and I spend an hour last night wandering through its aisles, collecting an array of fun things for our home and our stomachs. Knowing I had a Christmas party to attend this weekend, I grabbed a bottle of wine for a hostess gift and turned to find a display of fun wine bottle decorations – like little scarfs, Christmas sweaters, etc. all sized down to fit a wine bottle. Miniatures are simply the cutest! I picked out three different items that I was very tempted to buy. But I held back when I realize (like I often do) – I could totally make this! 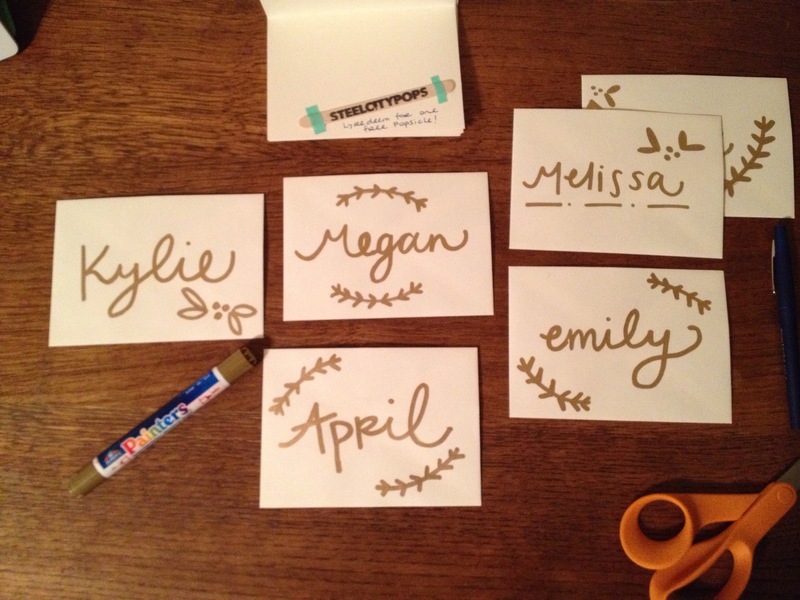 The latest craze to hit my life: the beauty of a gold paint pen. I took the pen from my parent’s house to work on a project for my Grandmother’s birthday, and I’ve been playing with it ever since. This week, I was putting together little gifts for my co-workers, and the pen came out. (I gave a gift card for a free pop from Steel City Pops, and because that place is so clever, a gift card is a stamp Popsicle stick.) I love, love, love how these cards turned out! 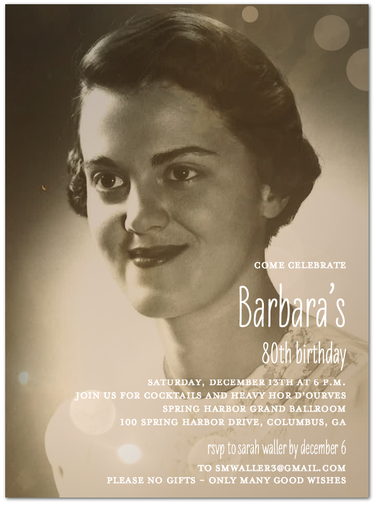 Several months ago, my mom and I sat down to brainstorm ideas for my Grandmother’s 80th birthday. 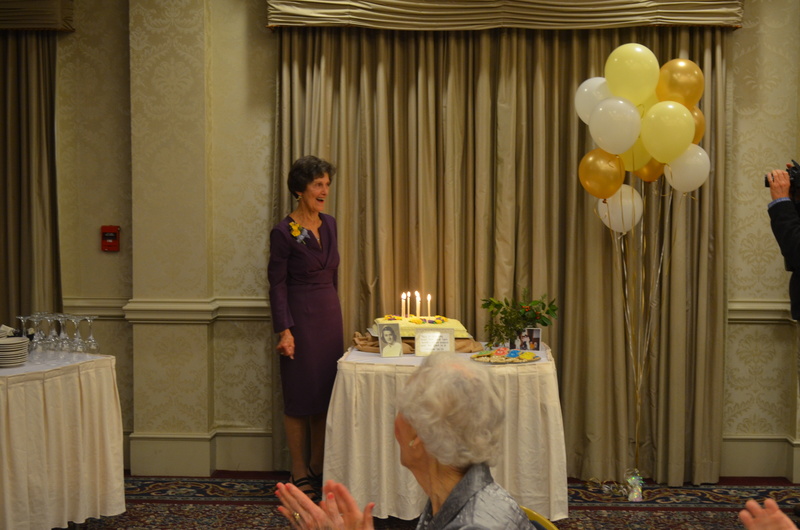 Our initial ideas were grand: a four course meal and a string quartet. But as the weeks progressed and our ideas receive feedback from our financial backer (Dad) and the guest of honor (Grandma), we decided to tone down the party. It would be a simple cocktail party with heavy hor d’oruvres and lots of friends and family. Fifty of Grandma’s dearest friends and family were able to make it. 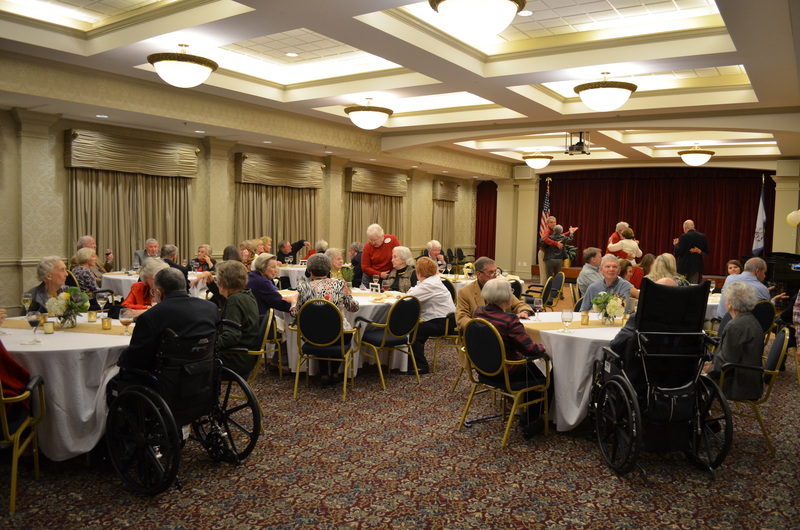 The party took place at the retirement community Grandma lives at in its grand ballroom (which was great because the room itself was already well decorated and beautiful). 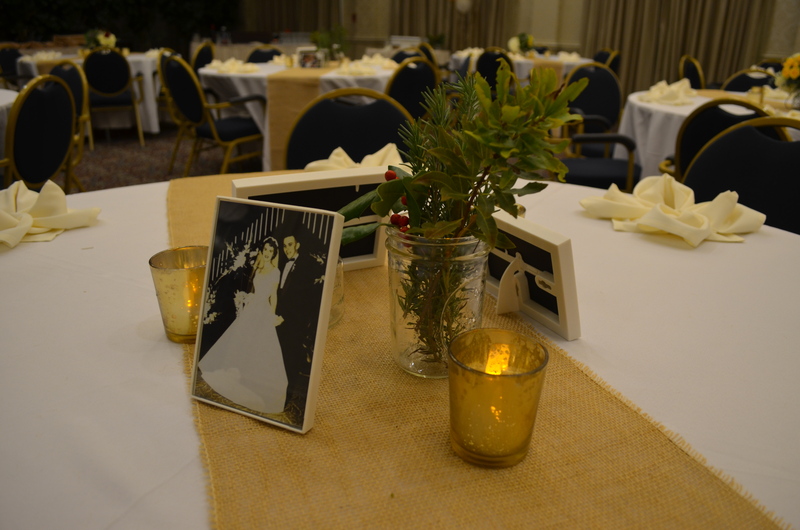 We coordinated with the staff beforehand, and they had the entire room set up when we arrived. All we had to do was set up the finishing touches. The facility even had its only helium tank, making it easy (and cheap) to have lots and lots of balloons. Despite it being a cocktail party, we had enough chairs for everyone to set down. My parents hired a piano player, and as you can see below, a few couples danced (so precious!). 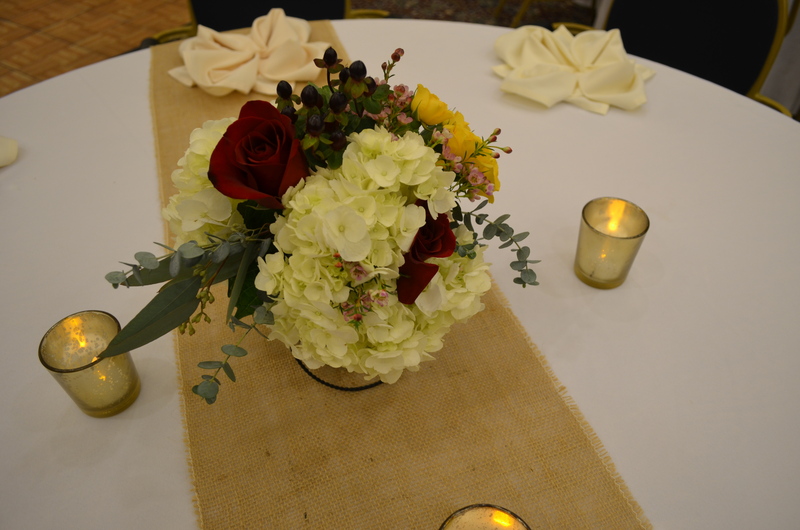 For the table decoration, we used 14-inch-wide burlap table runners at each table. Though the runners looked incredibly long when we pulled them out the box, they ended up being perfect length for the tables – only skimming the floor on either side. Each table also had three to four gold, mercury glass votives. (I purchased sets from Z Gallerie.) We weren’t allowed to use real candles, but the fake candles we purchased worked just fine. We knew we wanted to have a florist help with the flowers, but to avoid a crazy cost, we decided to purchase only four centerpieces. My mom said she met with the florist for 45 minutes, and the woman created arrangements that were even more beautiful than we imagined. We wanted to color scheme to be white, deep reds, dark greens and purple with touches of yellow. And she did beyond an amazing job. (The picture below fails to display the head of kale she included in each arrangement.) Again, simply stunning! 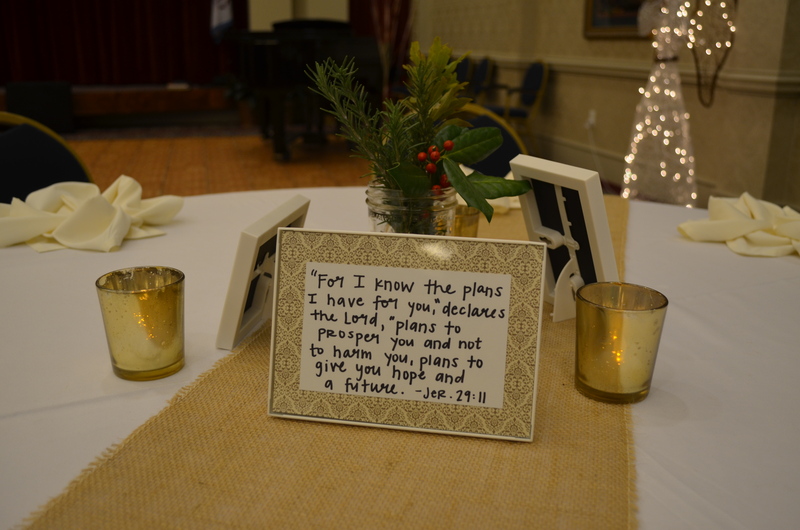 Along with pictures, I also included frames with a beloved Bible verses. The one pictured below is one of my favorites. To help fill in spots, I foraged around the retirement community for lots of rosemary, holly and other interesting foliage. Using jars I brought from home, I made arrangements for the tables without flowers. And on a spare table where we set the guest book and party favors (some delicious candied pecans), I placed large vases full of holly. These arrangements were the perfect touch to complete those “empty” spots. 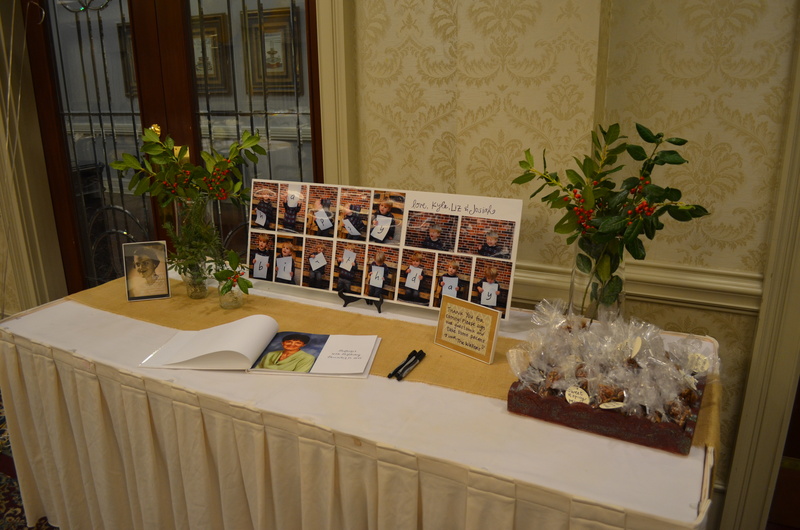 Using Shutterfly, we created a photo book as our guestbook. Each page had a picture of Grandma with plenty of white space for people to sign. We knew that people wouldn’t fill all 20 pages, but we figured Grandma could place cards or pictures from the night in it. The best detail of the night was a collection of photos my sister-in-law sent of my nephew. I have distinct memories of doing this as a kid – holding up each letter and then Mom mounting them to a board. 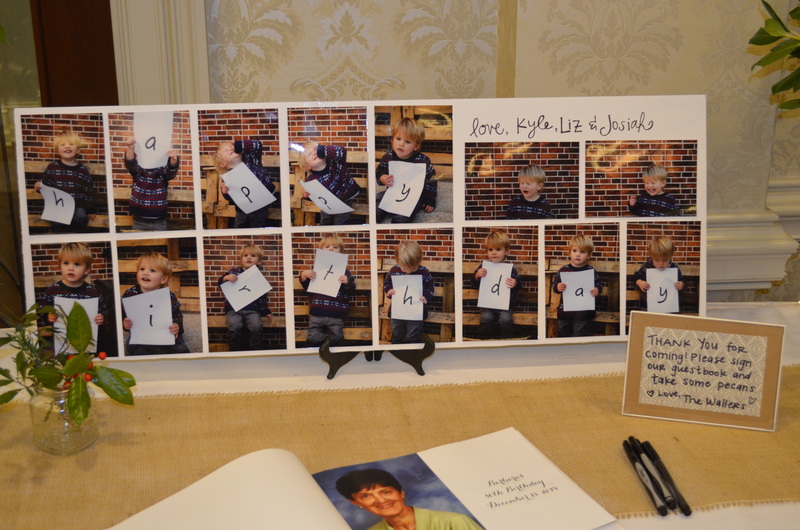 The fact is – pictures of a 2-year-old will always be a crowd pleaser! Finally, what is a birthday without cake? 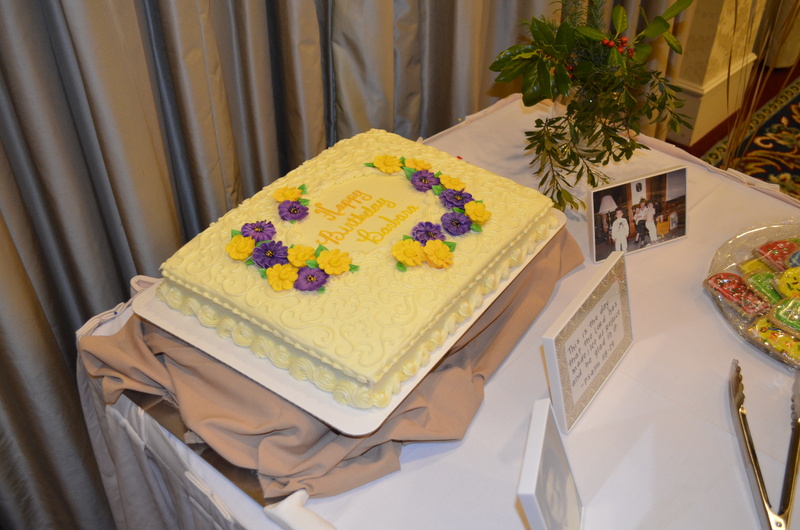 Mom purchased the cake from Pat-A-Cakes in Columbus, GA. The details on the flowers were spectatcuar, and it tasted even better than it looked. For a sweet touch, I made gingerbread cookies – using a B-shaped cookie cutter – to help tie in the holidays. These cookies are always a crowd pleaser. Overall, this party was a blast! It was an honor to be able to do something special for someone who means so much to me and many others. My grandmother is the kindest, most generous and supportive person I know. In her career as a nurse and still today, she spends countless hours selflessly helping so many people. And in her spare time, she can whip up the most spectacular sewing projects you have ever seen! From making clothes for my American Girl doll to teaching me how to set up my sewing machine, she has always encouraged my creative side. Plus, she’s the most avid reader on this blog. I know she’ll be reading this soon, so Grandma: Happy Birthday. I love you! 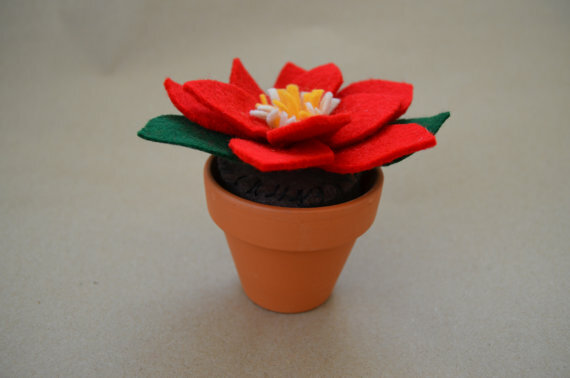 When I came home with the wrong size terra cotta pots (The felt cactuses I sell on Etsy use 3-inch pots; I purchased 2-inch pots), I decided to make the most of my mistake. 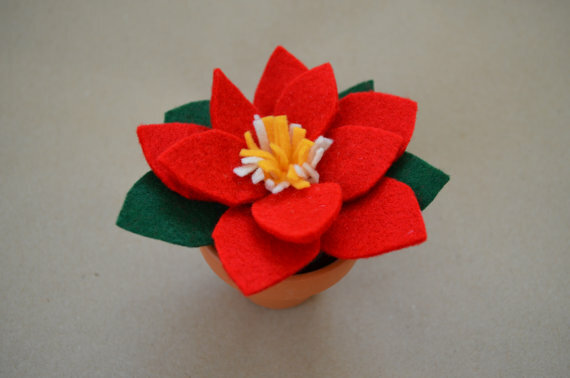 The result were these adorable, mini felt poinsettias. 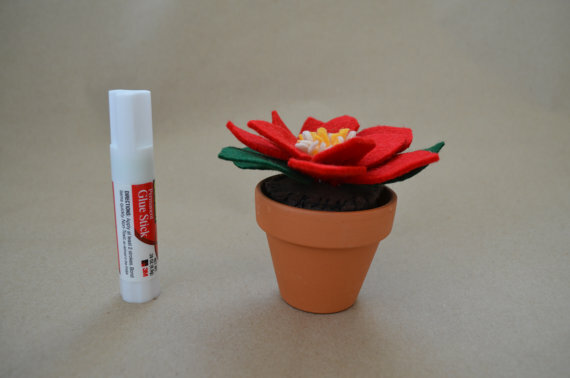 To create the flower, I used a similar approach to how I create the cactus flower. I took a small rectangle of yellow felt and cut slits along the width. I did the same with a small white rectangular piece of felt. I then rolled up the yellow felt and continued with the white, creating the center. 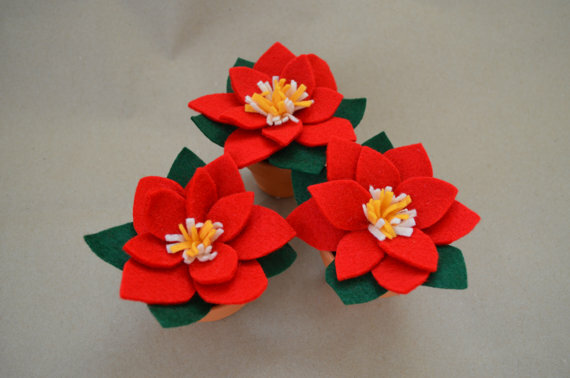 Next, I hand-cut the red petals (sorry, I don’t have templates) – 5 smaller petals and 5 slightly larger ones – and 4 large green leaves. 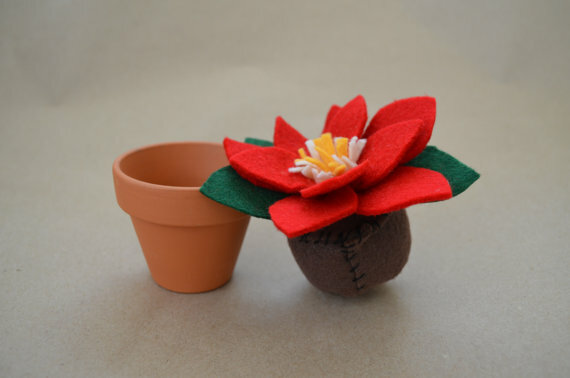 I then attach them one-by-one until the flower is complete. The miniature size is what gets me. My gosh, these flowers are just so darn cute! Growing up, my mother had the best mottos to live by. My favorite: “Always know what makes you happy.” So when the struggles of life seem too much to handle, you know what activities or items can help pull you up. 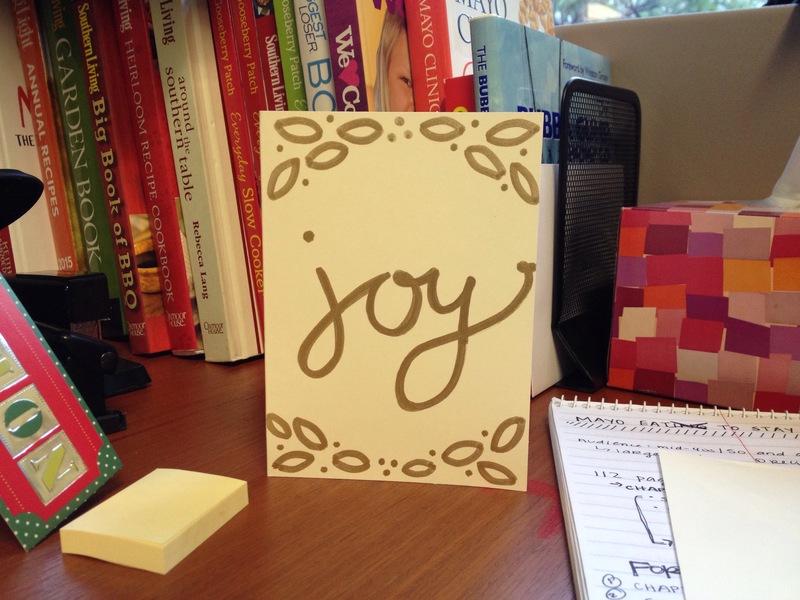 For me, crafting is my go-to tool for happiness. My Thanksgiving was a week of personal struggles. I had to have surgery on my left eye. The anticipation was a heavy mental burden, and the post-op pain and physical injury was not easy either. So on Sunday after my surgery, when I was finally starting to feel more normal, I sat down and created a simple rosemary wreath. I didn’t worry about taking pictures of my process (sorry), but trust me, rosemary wreaths are so easy to create. And I was able to use items I already had available. I used an embroidery hoop as my wreath’s base. (You could use so many other forms, but this is something I already had at the house). Using more heavy-duty scissors, I cut 8-inch sprigs of rosemary from my parent’s garden. Then I made small bundles (with 2 or 3 sprigs each) and use a rubber band to secure each one. Then I used floral wire to secure each bundle to the embroidery hoop. And if necessary, I used the floral wire to secure a few odd sprigs that didn’t flow well in the circular shape. And that’s it. The 30 minutes it took to create this wreath did wonders for my overall well-being. Plus, it made the room smell so wonderful! Pardon the cheesiness, but these moments of happiness are the best kind of medicine.